Birdoswald, built on a high spur between the River Irthing and Midgeholme Moss, was the eleventh fort from the east end of Hadrian's Wall. The antiquarian Reginald Bainbrigg described its 'great ruynes' in 1599, but archaeological excavations only began in 1850. Later excavations include work by Francis Haverfield, F G Simpson and Ian Richmond. 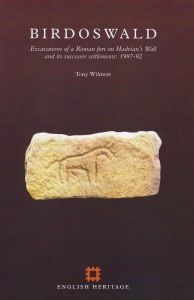 The 1987-92 excavations directed by Tony Wilmott and reported here explored a long and complex stratified sequence dating from the second to the twentieth centuries. Work concentrated on buildings either side of the via principalis, but also included investigation of the northern defences and the eastern wall at the porta quintana dextra. The earliest human activity at Birdoswald was to clear the dense woodlands before building the Turf Wall and turret 49b in the early 120s AD, and a construction camp on the river promontory. These structures were replaced by a turf and timber fort and then a stone fort, which underwent numerous additions and changes in the second to fourth centuries, including periods of desertion and reoccupation. In the late fourth or early fifth century, the south horreum was modified and became the hall-like focus of a defended community. The building was replaced by a succession of timber halls built on or near the north horreum until the site was abandoned c 520, a sequence that provides a model for the sub-Roman development of communities at northern and western forts of the British Diocese. Reoccupation began in the thirteenth century, when a tower was built. After its collapse in the sixteenth century, a bastle house was built as the centre of a farming settlement, attacked three times by the reivers of Liddesdale. Scientific evidence, including specialised studies of pollen, soil and bone played a crucial role in interpreting the sequence of construction and the nature of the settlement at Birdoswald. With skill and care, Tony Wilmott has integrated the archaeological, historical and scientific evidence contributed by numerous experts to reconstruct the life of the Roman fort and its later uses.